While Milan might not be the first Italian city to come to mind as romantic, this increasingly hip travel destination can provide the perfect romantic European getaway. Our friend and romance expert, Lily Heise of Je T’Aime, Me Neither, reveals her list of most romantic places in Milan gathered from her many trips over the years to this stylish Italian city. Get ready to discover her top romantic things to do in Milan the perfect romantic trip, including most romantic sites, unique activities, and of course, the best of food and drinks. 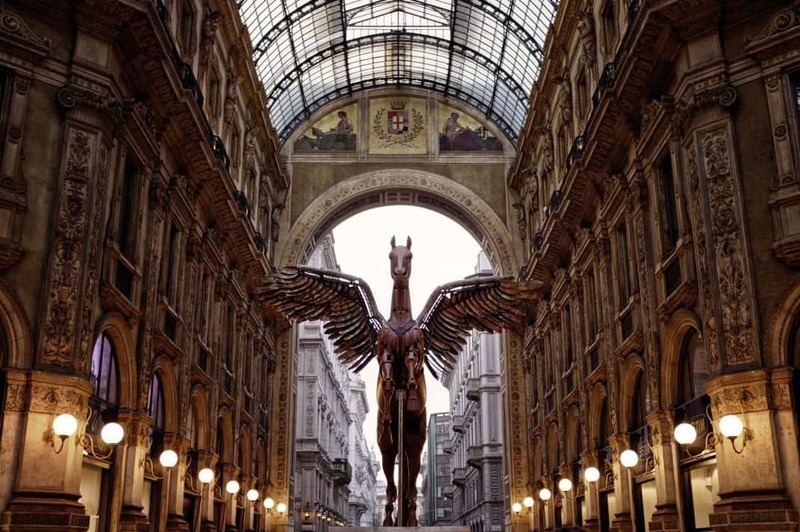 To plan for the perfect trip to Milan, check out our transportation in Milan guide, our selection of top accommodation in Milan and our recommended day trips outside of Milan. It’s hard to beat the romantic ambiance at the top of the city on its most iconic site, il Duomo. The city’s immense gothic cathedral, made of a lovely pearly marble, is covered in over 3,000 statues and dozens majestic spires, all of which are best admired from the rooftop. It’s a unique, one of a kind place to steal kisses and take fabulous selfies, plus the views of the city are stupendous. I can still remember my first trip up to the top while I was studying in Milan and left totally in awe. Visiting the rooftop terrace is becoming increasingly popular so you may want to come either early or late and get skip the line tickets. Milan is known as Italy’s fashion capital and this gorgeous shopping arcade encompasses this chic elegance. Completed in 1867 and in honor of unified Italy’s first king, Vittorio Emanuele II, the splendid four-story structure, leading from the Piazza del Duomo to the square in front of la Scala Opera House, is covered in the most amazing cast iron and arching glass roof and decorated in whimsical mosaics. During the day it can get pretty crowded, however, in the evening it’s much less busy in addition to being beautifully lit, providing lovers with a completely enchanting ambiance. You could possibly stop for a drink at the refined Biffi Caffè, founded in 1867, but before you leave, be sure to pause in the center to twirl three times (and on one foot) on the, um, manly parts of the bull mosaic under the central dome. This act ensures you’ll come back to Milan. I do it every time and, after 20+ visits to the city, it obviously seems to work. Again, I wouldn’t necessarily include a big name site just for the sake of list-making, however, this one has many very romantic qualities (and it’s once again free). Popular with locals and visitors alike, the large park extends over 95-acre behind the castle and was laid out in 1888. Strolling its meandering pathways, you’ll come across ruins of ancient walls, duck-inhabited ponds and the Ponte delle Sirenette, the Little Mermaids’ Bridge—the perfect spot for a kiss! The Italian great mind and artist Leonardo da Vinci spent 17 years in Milan, the reason one of his most famous works, The Last Supper, is located here. While it’s on many people’s Milan bucket list, it’s also a rushed visit which requires tickets purchased weeks in advance. Instead, or in addition to seeing this delicate and beautiful fresco, cross the street to visit the lesser known, and very charming Vigna di Leonardo. In exchange for his masterpiece, the legendary artist was gifted a plot of land across the road in 1499 by the Duke of Milan, where he apparently planted some grape vines. This small vineyard eventually ended up part of the property of its neighboring walled gardens of the Casa degli Atellani, a lovely Renaissance palace. Both can be visited on guided tours and are exquisitely romantic. It is an absolute must-do on a 2 days or 3 days trip to Milan. There are many romantic restaurants in Milan, that said, the most “milanese” foodie thing to do in the city is have aperitivo. The tradition of a bar offering a free buffet (often generous enough to count as dinner), for those who order a drink was actually started right here in Milan, so there’s no better place in Italy to partake in this. There’s also an incredible array of aperitivo bars around the city and some of the best are included in this Insidr article on the subject—among which the Fonderie Milanesi is ideal for stoking romance and Il Salumaio di Montenapoleone is chic and seductive, the right fit for after a walk around the glamorous fashion district! It was love at first sight between me and Milan’s classic tram, my former means of getting to school. Make it your own “streetcar named desire” by hopping on one to get around the city. No need to take the tourist circuit one, however, a more original option is to book on of your dinners on the historic ATMosfera restaurant tram. Dine of Italian cuisine while you’re taking in the city aboard this fun ricky streetcars, hold on tightly to your wine glass… or your sweetheart’s arm! Speaking of the tram…. Did you know that one has also been converted into a sauna? Going to the spa is a perfect couple’s activity… and Milan has one of the coolest city-center spas! Situated in an early 19th century building surrounded by a 16th-century wall during the Spanish occupation of the city, the site served as a tram depot for many years and is now home to the attractive and unique QC Terme Milano. They’ve done an excellent job of making use of the space and playing off of its history, like a yellow tram sauna in the garden along with the exterior thermal pools with the backdrop of the ancient walls, magically lit in the evening (the spa is open till midnight). The interior, with various heated and cool pools, saunas, steam rooms and creative relaxation areas, is equally magnificent. They also do a decent aperitivo, so you can combine all the delights of Milan here in one place! The sweet Canadian, April Lily Heise has been living in Paris since 2000. Author for the blog, Je T’aime, Me Neither, and her articles were featured in the Huffington Post, CondéNastTraveler.com, Business Insider, Frommer’s Paris and France travel guides, City Secrets Guides, DK Eyewitness, WendyPerrin.com, France Tourism UK, LonelyPlanet.com etc. After the success of her first book, Lily has release her new book, Je T’aime Maybe, that tells love adventures and stories set in the City of Love. For romantic tips for Paris, free to check out Lily’s wonderful blog, Je T’aime, Me Neither here. For more featured articles of Lily in INSIDR, discover her favourite romantic parks and gardens in Paris and her guide to the best trip in Languedoc Region in France.